"Originally listed at $13,450,000 NOW $9,995,000....... AN INCREDIBLE OPPORTUNITY TO PURCHASE A MAGNIFICENT MINT CONDITION HOME! 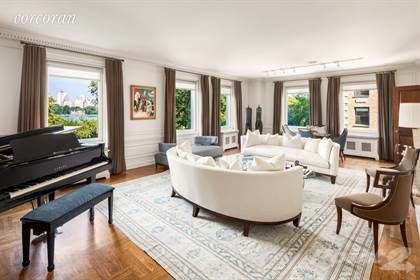 Stunning Central Park and Reservoir views from the grand living room of this beautiful 10 room pre-war home at 1115 Fifth Avenue. Enter off of a semi private landing into the dramatic approximately 50 foot long and 10 foot wide gallery with magnificent crown moldings and Donghia chandeliers. The gallery provides ideal space for entertaining and exhibiting art. Off of the living room with its high ceiling and wood burning fireplace is a wood paneled library. The master bedroom suite has a huge walk in closet that connects to a sitting room/office which can be converted back to a fourth bedroom. The master bedroom wing can be closed off for privacy with sliding doors separating it from the gallery. There are two additional bedrooms with baths en suite. All the baths have been exquisitely renovated. The formal dining room opens to the butler's pantry and large chefs kitchen where the Caesar stone island provides informal dining. The kitchen is fitted with state of the art appliances that include Sub-Zero refrigerator/freezer. Bosch dishwasher, Wolf cook top and Thermador oven. The butler's pantry has a full height Sub-Zero wine cooler. Adjacent to the kitchen there is a full size laundry area, a maid's room and full bath. The fabulous home includes central air-conditioning in the public rooms and through wall A/C in the bedrooms, Sonos sound system, new windows, hardwood floors, new wiring, recessed framing directors by Decorative Lighting, Inc. for assorted art work and Central Station Alarm system. It is located in a prime full-service cooperative building designed in 1926 by J.E.R Carpenter. There is a full time doorman, fitness center, bicycle room and live in resident manager. A 160 square foot storage space conveys with the apartment. See alternate floor plan." Hi, I'd like to find out more information about 1115 Fifth Avenue. Thanks so much!